TMS aims to play a leading role in the following areas in cancer research: Cancer Metastasis (EMT, etc), Microenvirnoment, Cancer Stem cells, Epigenetics, Bioinformatics, etc in Taiwan. 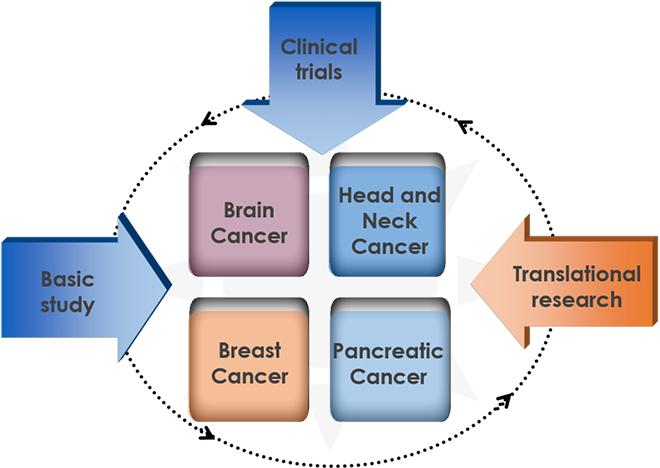 Through translating basic research into clinical research, TMS is dedicated to developing effective strategies for cancer prevention and treatment and to improve the well-being of cancer patients. Our translational research will focus on the development of novel cancer treatments in Taiwan. Our basic research will identify novel targets related to metastasis and drug resistance. These targets can be used as novel biomarkers for diagnosis and novel anti-cancer drug targets for treatment. These areas will definitely accelerate the development of targeted therapy and personalized medicine. Our studies will primarily focus on four cancers, which include breast cancer, brain tumor, head-and-neck cancer, and pancreatic cancer. We aim at publishing the results in international journals with high quality, thereby becoming a world-class basic and translational medicine research center for cancer and .transform CMU into a top cancer research university. To follow the new-drug regulations and guidelines of the government, our research focuses on three directions, “effective cancer prevention,” “precise early diagnosis,” and “novel targeted therapies.” We will conduct bench-to-bedside studies and promote novel detections and targeted therapies in clinical trials. We anticipate that these endeavors will help us become a world-class clinical trial center in this country and aids the set-up and development of medical industries. We proactively cultivate talents with expertise at each level, including basic, translational medicine, and clinical researches. These scientists will accelerate the industrialization of medical research. With cancer control policy, early diagnosis, and novel targeted therapy, we hope that the incidence of cancer will be reduced and the survival rate of cancer patients will be prolonged. This is the social responsibility of a medical university and we will try our best to fulfill it.